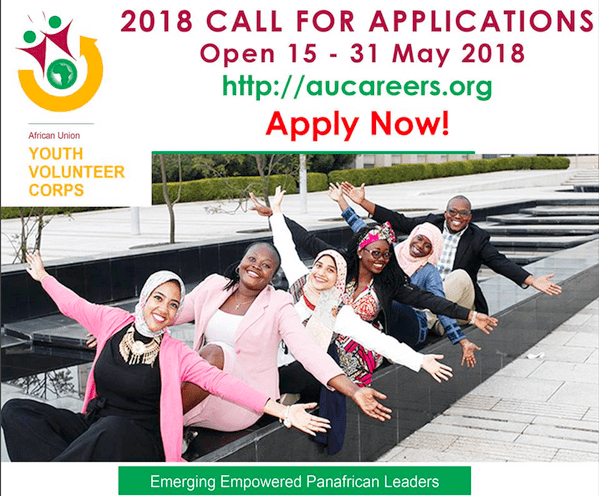 The African Union Youth Volunteer Corps (AU-YVC), established in 2010, is a continental development program that promotes youth volunteerism in Africa. The program aims to deepen the status of young people as key actors in Africa’s development targets and goals, enhancing their participation in policy development as well as design and implementation of relevant interventions towards the Africa Union’s Agenda 2063, ‘The Africa we want’. It brings people together to share skills, knowledge, creativity and learning to build a more integrated, prosperous and peaceful Continent driven by its citizens. The volunteering opportunities are intended to build professionalism and a sense of responsibility among the participants, thus enhancing their employability. Young African professionals are recruited to serve for a period of 12 months as AU Volunteers in an AU Member State other than their own. The next intake of volunteers for deployment in 2018 will be from the May 15th to May 31st 2018. 7. Has at least one year verifiable volunteering experience and one year professional work experience. Has a great deal of social networking skills. Months will be considered as a probationary period. 1. Economy return air ticket from home town to place of deployment. 2. A modest monthly stipend. 5. Separation allowance on successful completion of twelve (12) Months service. – Aspiring volunteers who fulfill all requirements should fill out the online application form and upload their CV. – Screening: Volunteer Applications and Volunteer Requests would now be screened for completeness through a vigorous and transparent process. Candidates whose application was not convincing, would be eliminated and notified. Volunteers are permitted to reapply a second time. – Matching: Applications of nominated volunteer candidates are matched with available vacancies according to the criteria specified by the requesting organization. – Selection: The AU-YVC would send multiple CVs (4-8) of matched volunteers to requesting organization to make final selection. – Volunteer Training: Prior to their deployment volunteers would be trained for a period of 2 to 3 weeks by the AU-YVC unit to enhance volunteers professional, interpersonal and life skills. The training aims to prepare volunteers for their country of deployment and/or enhance their capacity. – Deployment: selected volunteers would now sign a tri-partite agreement with their host organization and the AUC which shall guide the terms of deployment. – Progress Assessment: volunteers are expected to provide regular reports on their activities and address challenges to the AU-YVC unit. i am Pierre Roger BANAHOSE from kigali/Rwanda.I have tried to register but i failed. The system is showing the internal errors. MANJOO ANTHONY NIGERIA LIMITED (MANL),AN IMPLEMENTATION AGENCY, RESEARCHERS AND INSTITUTIONAL CONSULTANCY FIRM IN PARTNERSHIP WITH AFRICA EVIDENCE NETWORK AEN,SOUTH AFRICA AND INTERNATIONAL INITIATIVE FOR IMPACT EVALUATION 3ie,Inc,AS WELL AS GLOBAL INNOVATION FUND GIF,WELCOME THE PROJECT DEVELOPMENT IN INTERNATIONAL DEVELOPMENT POLICY AND PROGRAMMING IN LOW-AND MIDDLE-INCOME COUNTRIES (L&MICs),MOSTLY THE 9th BATCH OF AFRICA UNION YOUTH VOLUNTEERS CORPS AU-YVC IN OUR CONTINENT DEVELOPMENT PROGRAMMES.WE APPRECIATED YOU ON YOUR INITIATIVES AND BRIGHT EFFORTS OF THE ACTION PLANS. THANKS AND BEST REGARD ,DR ANTHONY O OGOSU,INSTITUTIONAL CONSULTANT/RESEARCHER. I would love to be part of this year’s team but am having my final exams probably in November would I be fortunate if I apply now?